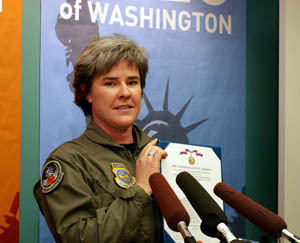 Today, in Federal District Court, Judge Ronald Leighton ordered that the Air Force reinstate Major Margaret Witt, a dedicated flight nurse that had been dismissed under the Don’t Ask, Don’t Tell policy. This is an exciting moment for everyone who believes in equality and an important advance in the fight to end discrimination against LGBT Americans in the military and in society at large. Perhaps most importantly, it is also a homecoming. Last fall, I flew to Spokane to provide technological support for our legal team. When I arrived at Margaret’s place, I noticed all of the things that make a house a home—family photos, memorabilia, and a big table in the middle of the dining room waiting for friends and relatives. It was a comfortable, and comforting, scene. Amid the photos were reminders of a life spent in service to our country. There were pictures of colleagues and friends. These were soldiers willing to put themselves in grave danger to protect each other and this nation. They were also friends that had grown to become a family. In today’s ruling, Judge Leighton noted that Major Witt’s return to service would do nothing to harm her unit’s morale. I knew that was true from the moment I saw those photos of her with her fellow service members and I cannot image anyone, especially a wounded soldier, that would not be comforted by Margaret’s beaming, beautiful smile. This is the beginning of a reunion for Margaret and another step in a continuing struggle for everyone who believes in equality. While I am thrilled for her, I look forward to the day when any American kid, gay or straight, can truly be whatever they dream of being, including a member of our Armed Forces. I plan on doing my part, lining up behind Major Witt and the countless other soldiers who have suffered under Don’t Ask, Don’t Tell, to demand that Congress take action on repealing this unjust policy. But for today, I really just want to celebrate and to wish Margaret a safe and happy journey back to her family. Thank you, Margret, for your sacrifices to make this country safe-and just.